Offers that’ll sleigh you at Sevenoaks this December | What Hi-Fi? Christmas. Time to get your highlighter out and spend a quiet afternoon with the big double issue of the Radio Times. Time to watch TV and listen to music. At last: time to Sit Down. And if you’re going to spend at least ten days Sitting Down, it makes perfect sense to Sit Down in front of something fantastic to watch or listen to. But let’s not forget: it’s also time to think about treating yourself – and others. And we mean really treat. So instead of yet another soap-on-a-rope, novelty autobiography or lump of coal, think bigger. Better. Something that’ll last years, and give real joy. 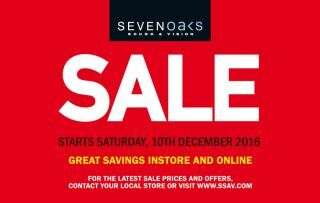 Something like one of the offers available in December both online and in-store at Sevenoaks Sound and Vision. For more kit than you can fit under your tree (and then open yourself, and put on your own kit-rack), visit the Sevenoaks Sound and Vision website – there’s much more available both online and in-store.